The Phantom Stranger is a being caught in a time loop. Near the end of the universe, the Phantom Stranger approached a group of arcanists who are trying to transfer energy from the Big Bang to extend the life of the universe. 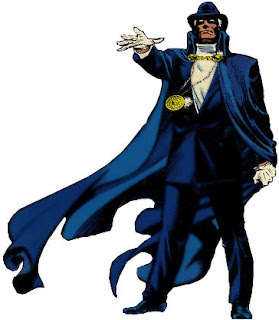 The Phantom Stranger realizes that one of the scientists is in reality an Avatar of Anti-life, and that their efforts will prevent the universe from ever existing. The story concludes with the Phantom Stranger passing a portion of himself to a scientist, who dives through the portal to the Big Bang, intercepts the beam that would have drained the Big Bang, and becomes the Phantom Stranger, completing the cycle.